One thing leads to another. While working on the new section of my Anglesey History website on Prehistoric Monuments I wanted to compare the geology of one site to the types of stone that were used to build the monument. I thought I had a geological map of Anglesey, but couldn’t find it, so ordered a new one. It arrived yesterday, and my wife and I spent part of the day poring over it with a magnifying glass, looking for interesting features. This map is mainly based on Edward Greenly’s pioneering work on the geology of Anglesey. His two volume 1919 work The Geology of Anglesey, followed by the geological map of 1920, are considered classics in the field. The geology of Anglesey is fiercely complex, and his 25 years of surveying the rocks of the island, with the latest geological theories in mind, unravelled its mysteries. 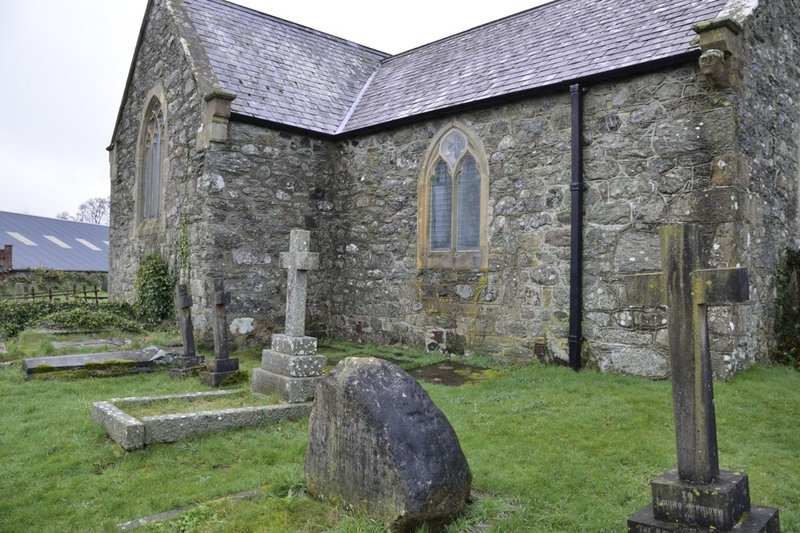 In looking into accounts of his life, most said that Greenly and his wife Annie were buried in Llangristiolus parish churchyard, under “a fine headstone of red ‘Balmoral’ granite.” I distinctly remember visiting a grave of a prominent geologist with an unusual headstone, a large boulder inscribed with the details, many years ago, but this was in Llansadwrn, not Llangristiolus. Which was correct? After another cup of coffee we hopped into the car and headed off on a circular route to both churches. When we got to the church we spotted the unusual grave stone, a boulder of Carboniferous limestone, before we even got out of the car. We crossed the graveyard and turned to face the headstone, only to discover that this was the grave of another very well known geologist with Anglesey connections. Sir Andrew Crombie Ramsay was a Scottish geologist who published The Geology of North Wales in 1881, as well as many other earlier important works. He rose to become the president of the Geological Society of London and director-general of the Geological Survey. He retired to Beaumaris, where he died in 1892. The inscription on his gravestone explains his Anglesey connection. His wife, Mary Louisa Williams, was the daughter of Rev. James Williams of Llanfair-yng-Nghornwy and granddaughter of John Williams of Treffos, in Llansadwrn. Her brother Owen was the grandfather of the famous Anglesey artist Kyffin Williams, thus making her his great aunt. In his autobiography Across the Straits, Kyffin Williams talks about playing with the Ramsay children when he was young. So, I guess Greenly was really at Llangristiolus. Back in the car to head towards Llangristiolus. We decided to take the narrow lanes from Llansadwrn through Rhoscefnhir and Ceint, which once formed the major post road from Beaumaris to Holyhead (more in this in another blog soon). After a bit of a wander around Llangristiolus churchyard I spotted a grave of distinctive red stone that stood out against the grey slate and black marble of most of the surrounding ones. 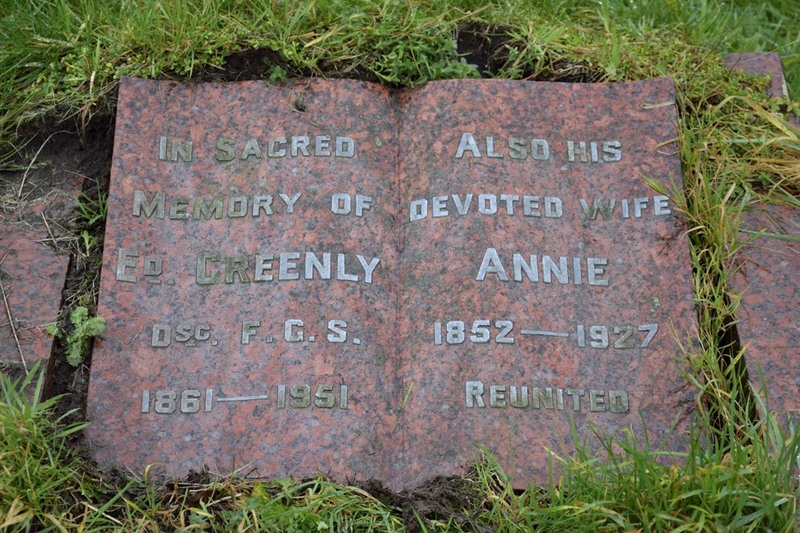 Here was Edward Greenly and his wife Annie, “reunited”, as the inscription said. Edward was born in 1861 and died in 1951, having been widowed since 1927 when his beloved Annie died. They first met when he was just 14, when she and her parents visited his family home. She was 11 years his elder, but their similar intellectual and scientific interests soon blossomed into a close friendship, then love. But after four years their parents, worried about such a relationship between one so young with one so much older, forced them apart. Eleven years later they met up again, and this time married in 1891. Their’s was a close scientific working relationship as well as a loving marriage. Annie also had a keen interest in science from a young age. During his years surveying the geology of Anglesey (and before that in the Highlands of Scotland) she was usually at his side. Although Edward’s name is solely on the publications, he always readily admitted she was instrumental in developing ideas and in organising the publications. She died just days after they jointly finished a short geological textbook called The Earth. To mark her contributions Edward set up an Annie Greenly Fund through the Geological Society of London to support detailed geological mapping. On the way home we stopped at Oriel Ynys Môn for a bite to eat and a look around the galleries. Who should we run across there but our new-found friend Edward Greenly, in a display in the history gallery, with a copy of his map alongside his portrait and biography.